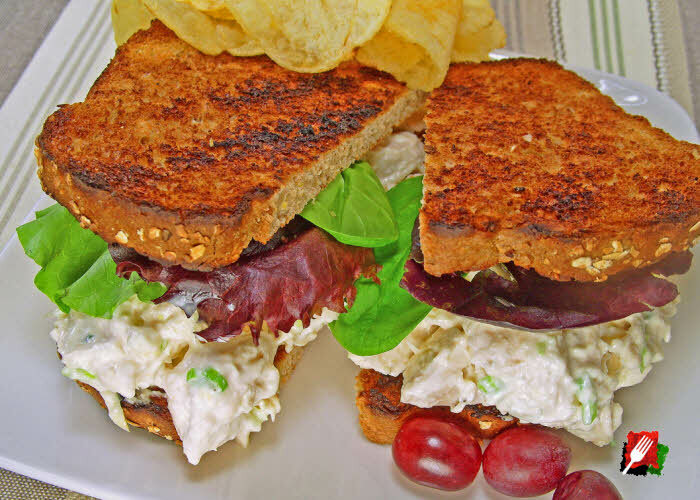 The secret to the best chicken salad you’ve ever tasted is whipping up some heavy cream, hand shredding the chicken to better absorb the flavors, and adding a little white wine vinegar and lemon zest to the usual chicken and mayo ingredients. Absolutely delicious! 1. 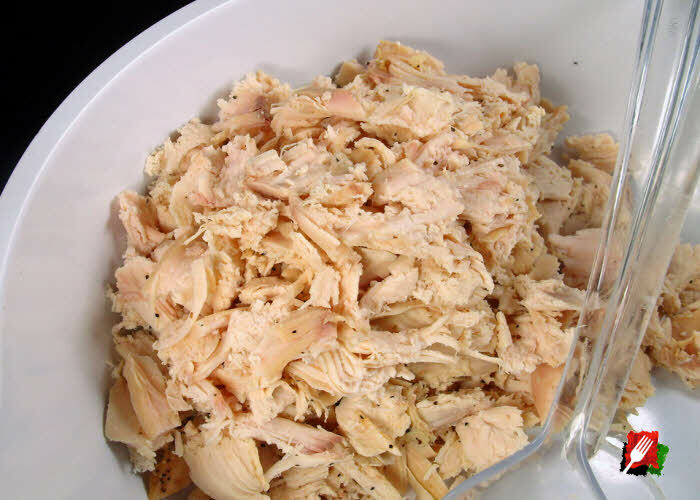 Cook 1 pound of chicken breasts,* let cool, then hand shred into 1/2″ pieces. Remove any skin or tough pieces during this process. Hand shredding allows more flavor to absorb in the meat and is more tender than cutting pieces with a knife. 2. In a food processor, blender, or hand mixer, pulse whip 1/4 cup of heavy cream for about 30 seconds until thick. 3. 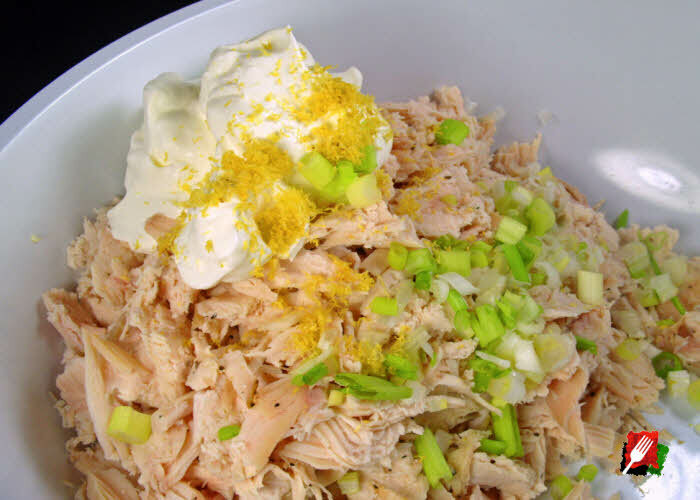 In a large bowl, add the shredded chicken breast, mayonnaise, white wine vinegar, and whipped heavy cream. Gently stir until well mixed. Set aside for a few minutes, then add the lemon zest, chopped fresh chives, salt and freshly ground pepper. Continue to stir gently until all of the ingredients are thoroughly mixed. Cover and refrigerate for at least an hour before serving (or overnight), to let the chicken tighten up and absorb all of the delicious flavors. 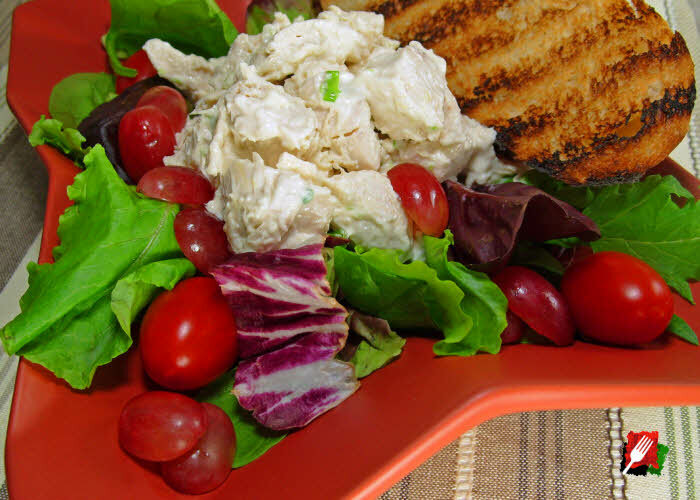 • Plate with a variety of green lettuce, tomatoes, and Italian toast. Chicken breast can be grilled, boiled, baked in the oven, or just use a rotisserie chicken picked up at your local store. Rotisserie: Buy a plain rotisserie chicken roasted at your local grocery store (not lemon herb, barbecue, or other flavors). The size of rotisserie chickens vary, but average about 2 pounds. A 2 pound (32 ounce) rotisserie chicken will render two 6-to-8 ounce breasts (about 2 cups) of white meat for this recipe. If using less chicken, adjust the other ingredients accordingly. Bake: For bone-in chicken, preheat oven to 350°F. Rub 4 large chicken breasts (about 4 pounds) with 1 1/2 tablespoons of olive oil, salt, and fresh ground pepper. Place skin side up on foil-lined baking sheet uncovered on middle rack in oven. Cook for 35 to 45 minutes until the internal temperature reaches 165°F with an instant-read thermometer, then remove from oven. Cover pan of chicken breasts with foil to keep moist and set aside for 45 minutes to cool. 4 large chicken breasts (4 pounds) will yield about 2 pounds after cooking and removing the skin and bones. To bake boneless chicken, use 2 1/2 pounds to allow for shrinkage during cooking and cook at the same 350°F for 25 to 35 minutes until the internal temperature reaches 165°F, then remove from oven. Boil: In a 3qt pan, add 32-oz box of chicken stock, 1 tsp celery salt, 1 tablespoon of peppercorns, 1/2 med onion, cook 2 1/2 pounds of boneless chicken breasts until 165 degrees. Grill: Rub oil, salt, fresh ground pepper on 2 1/2 pounds of boneless chicken breasts, then place on preheated med-high grill skin side up, grill for 20 minutes until 165 degrees. Also: Consider 5 hours in a crockpot, or cook in a skillet on the stove.